Have you caught yourself asking why is eating gluten free expensive? If so, you’re not alone. I’d guesstimate that 85% of people who attend my talks would agree wholeheartedly that going gluten free became a financial burden. But it doesn’t have to be that way. While I personally know all about the challenges of the gluten free diet’s expense, it’s not a hurdle in your journey to better health that can’t be overcome. In fact, I’m living proof that you absolutely can eat well and gluten free without breaking the bank. To talk about this topic and share about how to be prepared for emergencies when gluten free, I sat down with my friend Chandice Probst who is the co-author of a new book out called Gluten-Free on a Budget. She’s been living gluten free for a long time after getting diagnosed with celiac disease. And one of the coolest talks she presents is on Emergency Preparedness. Before you question why this is at all important, know that food banks don’t typically stock gluten free products or food. In fact, most food would be off limits to you and me should something in our respective communities go wrong. And something CAN go wrong… some areas are prone to hurricanes, others to frightening tornados, some to earthquakes. And consider the massive 6-foot snowfall that hit Buffalo, NY in late 2014 or Hurricane Sandy which plowed up the Eastern seaboard of the US and devastated suburban communities surrounding New York City and part of New Jersey. While there are some who have started to bring awareness to food banks of stocking gluten free items, the majority of us seeking assistance will be left out of luck for food if we don’t make some effort to be prepared on our own. Chandice shares how to get prepared in a way that isn’t complicated or overly time-consuming. 2:28 — Chandice shares her personal journey to discovering that she had Celiac Disease. Jennifer: Welcome back to the Gluten Free School Podcast. I’m your host, Jennifer Fugo. And today, we’re going to talk about one of my all-time favorite topics, which is how to save money when you are eating gluten-free. This is one of the biggest – I’m going to say grievances, gripes, complaints that most of us have who have to be gluten-free. It just seems so unfair because it’s so expensive to eat gluten-free, but it doesn’t have to be. I invited my friend, Chandice. You probably know Chandice. She is quite amazing. She is in a lot of different places. She’s got a brand new book coming out and I thought she’d be the perfect person to talk to about this because she does a lot of cooking and she’s got a lot of experience around how to save money because that’s what her book is about. Recently, she joined the Delight Gluten-Free Magazine team as a regular contributing writer and is also an Expert Among Us writer for SheKnows.com. Jen has been featured on ABC15, Channel 12, Arizona Midday, Women’s World, The Arcadian Journal, Total Kid Magazine and Channel 3, Your Life A to Z as a gluten-free guru. In her spare time, Chandice teaches gluten-free cooking classes and enjoys being a guest speaker nationwide at gluten-free expos and events. And in addition to all of these professional things that Chandice does (and I have seen her speak and she is fabulous), she considers her role as a wife, mother and every day cook to her family to be of greatest value to her and to everyone around her. Thank you so much for joining us, Chandice. Chandice: Thank you so much for having me, Jennifer. Jennifer: Why don’t you tell us a little bit about why you know so much about living gluten-free and Celiac Disease. Chandice: Yeah, absolutely! Well, in 2007, I experienced years and years of pain and trips to the emergency room of my sweet, newly-wed husband just carrying me to the emergency room because I couldn’t even walk from the pain. I had been misdiagnosed multiple times with IBS and ulcers. And finally, after my mom said she had gotten diagnosed with Celiac Disease, she told me I needed to be tested. I went and thank goodness I finally got an answer to what was going on. So that was what sparked everything. And my mom is my best girlfriend next to my husband. She’s my bestfriend. And so she and I just immediately jumped head first into it and decided, “We finally have an answer. It’s not the problem, it’s the answer. And so let’s make the best of this. Let’s make our favorite foods gluten-free. Let’s just be happy.” And that’s where everything started. Jennifer: One of the things that I love about you the most is that you are so knowledgeable about cooking and you make it seem so easy. Jennifer: I feel like you have a joy around food that a lot of people, when they begin down this road, they’re upset. They feel it’s unfair. And I understand. We’ve all been there where in some respect, you might feel like – I don’t know, somebody put the evil eye on you or whatever catchphrase you use. You feel like you’re just unlucky. But you always have a positive outlook, a positive take, which I really admire. What do you think it is about you that you have this ‘can do, upbeat, we can do this, we should come together’, where does that come from in you? Chandice: Oh, thank you so much. Well, I’m a rainbows and sunshine blogger, right? No, I’m just kidding. I am! When we first started, I wanted to be a positive influence on my family, on my community and on myself. I was not going to let it bring me down. That doesn’t mean where I don’t have days where I’m like, “Argh, I really wish I could have that.” It is frustrating. I mean, I just had baby daughter a week ago and to think of the fact that she could develop it, it does make you sad to think of that, that you could pass that along. But I have my mother in this journey and it has become a complete joy for us to live this life together and to help others see that it’s food. I’m one of the biggest foodies you’ll ever meet. I love food. I know I shouldn’t say this, but I live to eat, not eat to live. It’s not what I was taught in my degree. But I do because I love food. And that’s how my mom is too. And so for us, she was always the one who hosted Thanksgiving dinner and Christmas with all my cousins. She just immediately changed it to gluten-free. Nobody even knew. Her pies were immediately changed and everyone ate them just fine. They loved them. In fact, she started getting compliments on the new recipes. And so we just wanted to show people that this doesn’t have to be a negative thing. What a joy and an opportunity we’ve been given and many others have been given to spread awareness. I think any time we are diagnosed with any kind of illness, we’ve been given an opportunity to take it and use it to better the lives of those around us. And so, really, it’s just a decision that you have to make and that’s kind of what my mom and I did from the beginning. I’m grateful for her example and teaching me that. Jennifer: Because you and I both know, you can go into a gluten-free aisle in most grocery stores – I don’t know that every single one at this point nationwide has a gluten-free aisle – you go into the gluten-free section and especially if it’s your first time shopping for gluten-free, it’s a little shocking how much more expensive a lot of that stuff is. Jennifer: So what do you think is the first thing you would say to a person if they’ve got a pretty strict budget? Maybe they’ve got a lot of kids. For me, my journey began with my husband being laid off from work. So all of us have different budgets and we need to work with them. What would you suggest as maybe the first or second thing that you could do to start saying, “Okay, it’s not going to be that bad. This is what I need to begin doing in order to rein in the cost.”? So I think that to allow yourself a little bit of money in the very beginning – just a little bit, it could be $20, it could be $50, whatever – go and buy a couple of things that maybe you wouldn’t normally, do that, get it out of your system. And then what I would suggest is okay, maybe you find some things that you would like as an occasional treat, once a month, getting that box of cookies that you just love, reach out to the vendors and ask if they have an opportunity for you to – do they have to free coupon they’d be willing to send someone who is recently diagnosed. I can guarantee you almost all of them would happily send you a free product coupon or at least a coupon for a dollar off and that’ll save you. People are willing to send it to you if you’re willing to ask. All it takes is a simple email. The other thing is (we talk about this all the time) eating gluten-free naturally is the best way to save money and it’s the best way for your body to heal. Most people who have been diagnosed with Celiac Disease or gluten sensitivity, they have a lot of healing that their body has to do. And if you’re going to continue to fill it with junk after that initial go-crazy at the store, your body is not going to heal like you want it to as quickly as you’d like it to. So fill it with naturally gluten-free items. They are so cost-effective, they are so delicious and if you learn great ways to prepare them, you’re not going to miss the other stuff. Those are the things I definitely recommend. And buying in bulk? I love Bob’s Red Mill Cornbread. That’s one of the corn breads that I prefer. I make it at home from scratch as well, but if I’m in a hurry, that’s the one I like. So what I do is I buy it in bulk. And bulk can be as little as six bags and it cuts the cost 20% if you buy six bags at a time rather than one. Well, those bags are only like $4 each, so to take – it’s just an easy way to save a little bit of money by buying in bulk. Costco has lots of options now as well. So those are the biggest things that I recommend. And then, use your crockpot and use those cuts of meat that can turn it into an amazing dish from maybe a cheaper cut of meat. Chandice: Yeah, don’t go there. Jennifer: Do you want to explain why there’s a difference between buying in bulk and the bulk food aisle? Chandice: When I say buy in bulk, I mean buy a quantity, a case quantity so you can get the 20% discount. And if you walk into your local grocery store and say, “Can I buy a case of this and will you provide me with a discount if I do?”, most of them are willing to do it. If they’re not, Amazon is or the actual company. So the reason that buy in bulk using the bulk bins is problematic is that those bins can be totally contaminated. People do not care about using the right scooper. So they’ll go from the wheat germ over to the brown rice over to – oh, my goodness and it’s a huge, huge risk that you’re putting yourself in. And for saving a couple of bucks, that is not the way to go. So definitely don’t use those bulk bins. Just imagine that they’re completely contaminated and don’t even go near there. Jennifer: That is one of the biggest eye-openers for me when I was on this journey. I was like, “Oh, well, I’ll buy the quinoa in the bulk bin and I’ll save so much.” And then I came to learn that really, you have no idea if they’ve even washed that bin out and what was in it prior to the quinoa or the rice. You have no clue! Chandice: You don’t. It’s quite scary. Jennifer: It really is. I don’t know if you’ve heard this. A lot of people make jokes about, “You’re going to buy these gluten-free beans and you’re going to buy these gluten-free rice and everything is marked a gluten-free and it’s a joke,” but in reality, to you and I, that’s a lifesaver that the company has gone and done due diligence to make sure that these dry ingredients are actually gluten-free. So that’s a better way to actually get your grains and beans and other dry ingredients, to look for something that’s labeled gluten-free. Jennifer: So why don’t you tell us a little bit about what are some of the best ways to stock a gluten-free pantry so that it is forgiving of someone’s budget? So you need to learn what your family enjoys and what they don’t and you need to be able to make recipes that are good enough that the whole family will eat them. So keeping those pantry items on-hand that help you achieve that is incredibly helpful. We have the list on the book, but keeping things on hand like just your gluten-free beans. I’ve learned really quick that gluten-free canned beans are so much more expensive than dry beans. Oh, my gosh! Ridiculously more expensive. If you’re willing to take a little extra time and soak them or cook them in your crockpot or cook the however you need to and then freeze them if you need to or can them or whatever, you’re going to save so much money. So we keep dry beans in the house always and that is a huge money saver. I don’t use canned beans. And then having other things in your pantry like having your brown rice pasta or your brown rice or your quinoa, all of those things on-hand, if you have some of those staples – certified gluten-free oats if you can tolerate them. I like having a gluten-free cracker or you can get a really nutritious multi-grain one that’s still gluten-free or you could go with something more basic. But having a couple of those things on-hand can set you up to make a great meal every time if you just keep your pantry stocked. What’s going to happen is if you don’t, it’s going to be 4:30 and you’re going to be like, “Argh, I have nothing to make for dinner” and that’s when you’re going to be tempted to go out and spend money that you don’t have on either gluten-free fastfood (which some people want to do that, that’s fine), but it’s going to break your budget or you’re just going to be tempted to go to the store and get more food. You just need to have some staples on-hand to always be able to make those meals that you love. Jennifer: And so I think the way that you and I approach this is very similar. In a sense, finding out that you can’t eat gluten could from a certain perspective is seen as a gift because this is a way for you to take better care of yourself and your family and your diet and your health. It’s sort of is like a kick in the past so to speak of saying, “I actually need to start being responsible for this and I need to figure it out). If we have, say, a woman that hasn’t really cooked before, she’s not comfortable, her greatest accomplishment in cooking is actually microwaving something (and I’m not making a joke and I’m not teasing anyone that is used to cooking with a microwave), Chandice, do you have any thoughts on – and you do teach cooking classes, what are some of the easiest ways if all of a sudden, someone is listening and going, “I have to stock my pantry now? You’re telling me I have to cook?”, what are some things that they could do to get in the mindset to see cooking as a doable feat and something that could even be enjoyable? Chandice: Cooking, for me, when my husband gets home and I get to go in the kitchen and have 30-45 miinutes by myself in the kitchen to create, it’s so fun. I’ve heard people ask all the time, “I can’t believe you like cooking. It’s so weird that that’s how you want to spend that time, 45 minutes at night.” I’m like, “It’s fun for me. I feel like an artist when I create this meal and my family is, ‘Hmmm… hmmm… this is so good,’” not every meal is like that, but I enjoy the fulfillment in doing that. So my suggestion is always get a crockpot. If you do not have one, get a crockpot. Get a couple of different kinds of meats that you like. If you like just chicken or you like roast or pork, whatever it is that you like, get those things, unwrap it, put it in the crockpot, top it with your favorite vegetables. We like carrots, we like red potatoes, we like sweet potatoes, some celery you can use, whatever you like. Put it in there, then start from there getting creative. “Okay, this time, I want to try rosemary and a bit of real salt. Those are the things that I feel like that I can venture this time.” Perfect! That’s a good start. Next time, let’s try something more Mexican. Let’s do some cumin and some chili powder. It is amazing how easy it is to do that in the morning. Literally, it will take you ten minutes. And then when you come home from work, you have this beautiful meal. You’ll walk into your house and be like, “Who cooked for me?” You cooked for you and you did such a great job. Jennifer: And crockpots are really an incredible invention. I don’t know who invented them, but they are one of the best things. I got over that fear of allowing it to cook while I was sleeping or away at work. I always thought, “Oh, my gosh! It’s going to burn the house down.” They don’t. They really, really don’t. Jennifer: They are safe. But they are really wonderful appliances to have to be entirely honest. And you don’t have to spend a lot of money. I think mine was probably about $25 and I’ve had it for eight or nine years now. You don’t have to go overboard if you don’t have the funds to buy something that’s $300. You don’t need that. Simple is typically the best. As far as food storage is concerned, let’s say I made five recipes today, I’m not going to eat them all today, what can we do to kind of save some of these food, so that it doesn’t get tossed out? Chandice: Continuing on from the crockpot into that, for us, after big events where we’ve had like a gluten-free ham or something like that (like for example at Thanksgiving dinner), we take that hock that people are like, “Ewww… well, we’re done with this,” and toss it and we put it in the crockpot and we cover it with pinto beans, water, some real salt, pepper and we let it cook all day. Tons more meat comes off that bone. And then we make it into a soup, a delicious soup. It’s a huge pot of soup. And not everyone wants to eat soup every night for a week. I would, but my husband tells me I can do two nights max, that’s it. I’m like, “Okay.” That’s it. And so what I do is I buy those gallon freezer bags and I dump the soup in there in portions and then I zip it and I freeze it. That’s an easy dinner to pull up when you’re like, “Ahhh, I need to make dinner.” And then what we’ll do is we’ll even pour that over some gluten-free tortilla chips and make nachos. So you can make it into a totally different meal. And literally, that one cost you all of – probably like $2 to make the whole bunch because you’re using a ham hock that you were going to throw away, you’re using dry pinto beans and water. I mean, it’s so easy to create, beautiful dishes. And then sometimes like if I have pomegranate juice on hand or something more maybe a little nicer, I’ll add that in and creates this beautiful flavor into something totally different. It’s easy to put them in freezer bags, freeze it up and you can make a big batch of anything on the weekend and then freeze a bunch of that stuff for the week or even put it in containers and have lunches ready to go in your fridge. That’s a great way to do it too. Make those jarred salads where you put the wet ingredients on the bottom and then you layer it with your vegetables and everything. And then when you’re ready to eat your salad, you just shake it in the mason jar and eat it. And so it’s food storage, but then it’s also meal prep and thinking ahead so you’re not tempted to go and spend money you don’t have to buy junk gluten-free. You really just always have great meals on hand. And it is important to buy a little extra every time you go to the grocery store. So if you always buy canned green beans, buy two extra cans every trip and buy something different every time. Rotate your pantry so the oldest is at the front and then the newest is in the back. And having a pantry that’s constantly being rotated, if anything were to happen, heaven forbid, an emergency or you lost a job or something, you’re going to have a pantry that’s going to sustain you for one to three months and buying those bulk things, the big gallon buckets of brown rice, so you have a 30-year food storage and you have your basic pantry food storage. I’ve had friends who lived off that for months on ends because their husband lost their job. Jennifer: And it’s a really scary thing. Even though the economy is improving, there are still people who lose their jobs who got laid off. This was a reality for me. It was something that took my family entirely off guard and it took us four years for my husband to eventually get re-employed. This is not something that’s a fantasy. And also, we’ve seen a 6-foot snowfall in Buffalo. I mean, who anticipated six feet of snow! That would be above my head. You’re not going anywhere. Jennifer: As you’ve said, we’ve had that super storm, Sandy, we’ve had some major catastrophic events or if you live in the Midwest, there’s terrible tornadoes, there’s hurricanes in Florida, we should be prepared. And I think that this is a really smart and intelligent way to go. Do you also have any thoughts on how to best use your freezer? I think people think it’s only for ice cream and for desserts a lot of times. Do you have any thoughts on how to save money as far as utilizing the space in the freezer? Chandice: It’s true. And the way that everything we’ve seen in the direction of our world, I don’t think that the natural disasters are going away. I think if anything, things are changing and we’re going to have probably more and that’s scary. But if you’re prepared, it doesn’t have to be scary. It really doesn’t. You can sustain your family and you can take care of yourself and not feel like you have to be alone – so having those things on hand. I like the freezer. Like I said, we freeze meals and we put them in there a lot. We use those freezer bags. And the great thing about the freezer bags is you can lay them flat and flash freeze them and then you can have like this stack of 10-high meals because you’ve laid the bag flat. I would suggest doing that to get the most room out of your freezer. And then all is labeled. Label the day that you packed them so that you know, “Okay, it’s been 18 months, we’re not going to eat this.” That way, you’re constantly bringing – like I told you with your pantry, it’s the same with your freezer. Bring the older stuff forward so that you are reminding yourself, “Ooh, I need to pull that out and use it for dinner tonight because I only have a month left to use it.” That way, you’re not wasting anything, but then you’re constantly replenishing that freezer. Although do keep in mind, in the case of a natural disaster, you probably won’t have power. So just stock on things that you can easily get into and cook without needing heat or even water. Although I would highly suggest before you even stock your food, get yourself some sort of water supply. We have two big barrels of water, those big, blue barrels. It gives you so much comfort in knowing that you’re going to be able to have food and water. And so stocking up on those things that can easily be eaten without electricity to warm the up is also very good. I like the canned chicken from – I believe it’s Costco. It’s gluten-free. It’s canned chicken, so all you need to do is use your can opener, open it up and you have some protein or like stocking peanut butter. You just have to make sure to rotate those things because they can go rancid. Jennifer: I love this. I know this isn’t necessarily on a budget, but this is thinking ahead. A lot of times, the idea is if I’m on a budget, I can only eat for the moment. I only can get enough food for the week. And when I actually saw you give an excellent presentation on this, the idea of being prepared, thinking ahead because this stuff does happen sometimes when we least expect it. I’ve even had clients who their mother or their father ends up suddenly in the hospital and they are sort of trapped down at a hospital that doesn’t serve anything that is even remotely friendly for someone who, say, has Celiac Disease. You’ve got to have something available for yourself. You might not have that 45 minutes at night to cook a meal. Regardless of whether it’s a natural disaster or it’s a family emergency or whatever it may be, being prepared and thinking ahead definitely does help quite a bit. Why don’t you tell us a little bit about what was the mindset behind writing your book. I’ve written about it. I know you’re writing about it. Our books are – I think they’re both really great books, but they’re quite different. You always have a different take on things. So why don’t you tell us a little bit about what was the mindset behind Gluten-Free On A Budget? Chandice: Well, I love your book. You know that. I would highly recommend that they use them in unison. Our book is full of over a hundred recipes. It is a book that there are some guides in the beginning and at the end as far as stocking a pantry and health is wealth and all of those things. But mainly, it’s focused on the recipes and the color photos and everything. However, I like using your book and ours together because yours helps us feel empowered in the grocery store and it’s kind of a nice companion. I feel like they’re great companions. Jennifer: They are! They’re like sister books. Chandice: I know! I want to see on Amazon that Amazon is recommending the two together like they should be bought together. Chandice: I say, “Yes, we are because I will use every last bit of that chicken.” I mean, I will boil it down to make broth to make another soup to pull off every last bit of meat that is going to come off that chicken. I will make six different meals out of one chicken. And it’s because that’s the way to save money. So we wanted to show people that living gluten-free on a budget can be delectable and delicious and mouth-watering. Nobody has to know that it’s on a budget or that it’s gluten-free. We wanted to show those things because it hasn’t really been shown on a budget and the reason that you can do that is because we teach you how to use your flowers at home to make the right amount of flour needed for that recipe or there are lots of recipes that don’t require any flour. We show you how to do it without. They can feel empowered to cook in their own kitchen and create delicious dishes that are gluten-free and budget-friendly. Jennifer: There is something to be said for giving a chance to a different approach to things. And that’s why I really love what you’re about because it is a much more open-minded approach to cooking and having fun with it as opposed to, “This is the way it’s done. This is the right way. This is the only way.” I think sometimes, that’s just not helpful for people that need a little more love and light in the process of getting cooking and baking gluten-free right. I really appreciate you coming on the podcast and sharing with everybody a lot of the information that you know and especially too about giving people this little idea in their mind, putting it in there about being prepared and getting prepared just in case because it’s something we don’t hear enough about and it’s certainly something I’ve never talked to anybody on the podcast about, but this is important just in case of emergency. Thank you so much, Chandice for sharing all your wisdom with us. Chandice: Yes! Thank you so much for having us on, Jennifer. We always love talking to you and appreciate all that you do for our community. Jennifer: I appreciate what you do as well. So everybody, please stay in touch with Chandice. You can go and visit Chandice at GlutenFreeFrenzy.com. She is on every form of social media – Facebook, Twitter, Pinterest, Instagram. You name it, she’s on it and I will put all the links below as well as links to go buy her brand new cookbook, Gluten Free on a Budget. And then remember, before you sign off today, please go subscribe, rate and review this podcast and then head on over and leave some questions and comments, Chandice and I would love to hear from you, we’d love to know what your questions are around budgeting and any difficulties or challenges that you’ve had as well as maybe what some successes are. Thank you so much for constantly tuning in, emailing us and letting us know your feedback. We love the praise that you guys have given us as well as the suggestions of guests. We definitely take everything to heart and I’m looking forward to constantly connecting with you throughout this coming year. Have a great day and I look forward to seeing you the next time. Bye bye. 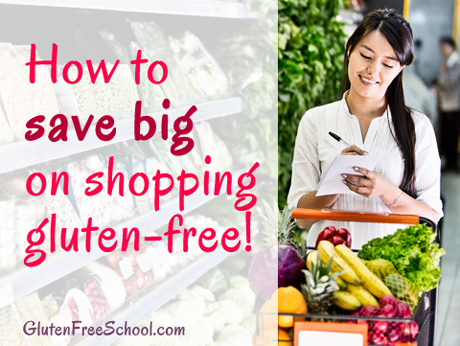 CLICK HERE to purchase Gluten-Free on a Budget! has been on my mind a lot as I see the world situation worsening, about how to be gluten free in an emergency, thanks for the advice. I know bulk bins not a good idea(in Canada much more diligent about them, all gluten free items are kept on the other side of the store and the scoops are changed and new ones put out) how though do you buy the flours you need, because except for the bulk store I never see them anywhere else, eg. teff flour and some others. ? thanks again for all the information, it has really made a difference. Teresa, Thanks for leaving this comment… honestly you’re going to either make your own if you have a vitamix or some other high powered food processor/blender OR just buy them online. As Chandice suggests, buying through Amazon is a great way to get what you need, especially in bulk. You could ask your local grocer if they could order them for you otherwise, or just call the company directly that you’ve researched online and see if they can sell and ship directly to you and again… if you place a bulk order, you can ask if there is a savings they could apply to the order to make it cheaper than buying everything in one package at a time. One word of caution though — GF flours really should be stored in the freezer in well-sealed bags. They tend to go bad faster. Oxygen, light and heat all contribute to this issue. So perhaps buy what you will need for several months rather than stockpiling OR make your own in your vitamix when you need it. I know that Chandice’s book does tell you how to mix flours for when you need them rather than doing an all-purpose blend used in every recipe since she told me (the non-baker) that many don’t work for all different types of baked goods. I will say this though… coconut flour is definitely more nutritious than many GF flours and has a lower glycemic index since it’s not primarily carbohydrate. Dear Jennifer, this is a very informative interview with lots of helpful hints… many thanks!